The magnetic "Hummingbird" and magnetic "Sundance Generator" are shown here in this mock assembly to give you an idea what they might look like when assembled together. 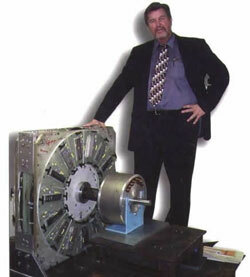 A 50 HP version of the Hummingbird motor is only 1/5th the physical size of a conventional 40 hp motor, thus revolutionary on that basis alone, but even more astounding is that in 1999, measurments on the Hummingbird motor were done with instruments brought by scientifically interested members of audiences in 47 states. Eachmeasured and confirmed the motor's power in torque was 5 times greater than the power supplied! The Hummingbird harnesses the additional power via the incorporated permanent magnets, and the unique way they are being finessed. Then in 2001 we demonstrated the Sundance Generator in all 50 States and it was shown to be a 100% efficient permanent magnet generator. I know most will say "that's impossible" but permanent magnet can be harnessed in the generator in a way similar to the way the Hummingbird motor finessed them, resulting in a 100% efficient generator. When we couple the Hummingbird motor producing 5 times more output torque relative to the electrical power supplied, to the 100% efficient Sundance Generator, and use one unit of the 5 delivered to keep the system going, we will have an energy harvesting system that should constantly deliver 4 "free" units of power continuously, harvested from the magnets. You might call this future system a fuel-less generator. A "perpetual motion machine" need only tap a perpetual energy source and permanent magnets can provide that. We appreciate that the definition of a "perpetual motion machine" has been altered to exclude such a possiblity, but that makes no difference. When a conventional generator has a core winding failure you have to shut it down and either re-wind it, or replace it, but the "Sundance Generator" is the world's first with cores that can be replaced while the generator makes power! Each of the 15 cores on the Sundance, provide 2kw (2 Kilowatts) so the total output is 30kw (30 Kilowatts). That's about three times the load your entire household needs if you turn on everything in your all-electric house, and about 15 times the average (nominal) load of 2kw. The Sundance Generator and a plethora of other astounding technologies were demonstrated before audiences in all 50 states in 2001. You'll see several demonstrated on video if you get your own Public Awareness Kit. 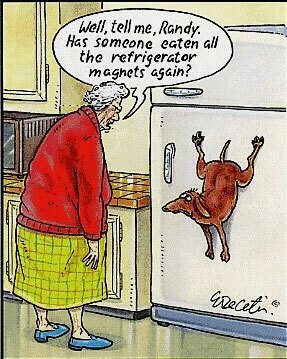 If you take a magnet and stick it on the refrigerator, is something happening? The magnet has weight yet it doesn't fall to the floor. There's no glue between the metal and the magnet, yet it defies gravity - virtually forever. The power required to sustain the magnet's weight against gravity is being applied constantly even though there is no apparent energy. Ask yourself - isn't the magnet providing the necessary energy constantly for as long as it is holding itself to the refrigerator? Many people ask "why we aren't planning to just SELL Free Electricity machines" ? Selling systems or even plans has been tried by many, but the attempts were thwarted. With a Public Awareness Kit discover that power can be made without burning oil, coal, or by making deadly nuclear waste with nuclear power. A small cabal of individuals have seek to control all Earth's resources including "human resources", and they've been using war and the fiat money system to manipulate us. That said, the cabal is small and it's only power is it's focus on it's objective. We believe that you and the many have far more power than this small cabal to liberate yourself with technologies and all that's needed is yourawareness and your desire to do it. One of their games is to have us using nuclear power plants for the sake of making nuclear warhead material for the sake of keeping people in fear. It's all for their "MAD" program - (Mutually Assured Destruction). As part of this ploy they've been storing radioactive waste materials in the ground, exposing us to the greatest threat in our history. You should know that R-Gas technology can neutralize radio-active waste and eliminate the incredibly costly and dangerous threat. 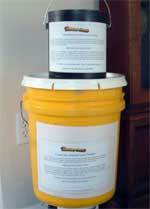 Proof that radioactive isotopes can be made completely stable and neutral was shown during the 2001 Technology Tour Show and is included in the "Public Awareness Kit. we offered to neutralize all of the radio active waste with R-Gas for one tenth of a percent of the Trillions of the tax dollars it costs to bury it in the northwest, but the cabal controlled government had no interest. The nucleus of an atom can indeed be trans-mutated! Yul Brown took a piece of cobalt 60 and after one pass with R-Gas the sample was more than 90% neutralized. The Geiger counter gave the radioactive level of the sample as 1,000 just before the procedure and instantly went to a reading of only 40 after he "cooked" the sample. After witnessing the demonstration, U.S. Congressman Berkey Bidel, called the Department of Energy and they sent five scientists down to witness the same demonstration with the same results; proof that the enormous danger of nuclear waste, can be completely eliminated with R-Gas. Subsequently government officials buried all records of this demonstration and have conveniently forgotten that it happened. Will the Power Companies Go Along? We believe the power companies will work with us, but if they don't we can send power harmlessly through the air, but if they join us, they'll make more money selling power produced at your home than they did making the power themselves; and since the cost of everything will come down gradually in this plan, they'll enjoy the many benefits of unlimited free energy, along with the rest of us. Send Power through the Air? Nikola Tesla developed the technology to safely deliver power through the air to you with efficiencies approximating 99.9%. You can see a demonstration of this technology on the videos that come with the "Public Awareness Kit". Help End Pollution and Economic Slavery - Worldwide with your awareness!